Starring Sean Lau (劉青雲), Nick Cheung (張家輝), and Karena Lam (林嘉欣), crime film, Integrity <廉政風雲 煙幕>, opened with good box office results. 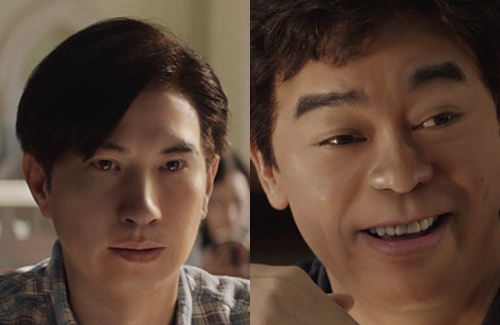 Not only does the movie boast a talented cast and exciting storyline, netizens were in for a surprise when they saw young versions of Sean and Nick in the film. These “young versions” of the male leads were not body doubles or look-a-likes. Rather, the director spent months searching for the right company and having them develop molds of Sean and Nick when they were younger in order to film the scene more realistically. Ditto………..Kinda sick of always the same few guys in these HK flicks……….Louis Koo, Nick Cheung, Sean Lau, Francis Ng…………I lost interest years ago in seeing any HK movies cause it’s always these same few guys and it’s always these extreme acting that just makes them seem like they are so good on the big screen when it is simply just a re-hash of similar characters over and over and over again…………Are there no other decent actors out there other than these few guys? They for sure didn’t use Marvel’s CGI tech; both Nick and Sean look like freaky wax figures. It looks garbage. Waste of money and time to even attempt this. If they really cared, they should’ve hired an American production company, but they are too cheap. Whatever happened to giving new/ lesser known actors a chance? Remember Infernal Affairs 1 and 2 they got Shawn Yue and Edison Chen and it worked fine in my opinion. This CG nonsense doesn’t help anyone… it’s a waste of money because it looks like crap. Nick Cheung and Sean Lau doesn’t need anymore screen time. It was hilarious watching this scene. it felt like i was watching a Pixar animated movie.